Edward Ruppelt ( upper left in photo ) was born in Iowa on July 17, 1923. During the second world war he was a B-29 bombardier and radar operator. He flew missions over India, China, and the Pacific with the original B-29 wing. During his service he was decorated with five battle stars, two theater combat ribbons, three Air Medals, and two Distinguished Flying Crosses. Following WW-II he earned a degree in aeronautical engineering and served as a flight navigator in the USAF Reserve Troop Carrier Wing. When the Korean War started in 1950, he returned to active duty at Wright Patterson AFB where he setup a new intelligence group for the ATIC. At that time, Major General Cabell ordered ATIC to prepare a review on what were then being called flying saucers. 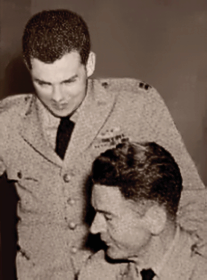 Lieutenant Colonel Rosengarten received the order at ATIC and offered Ruppelt the assignment. Ruppelt accepted the assignment, and his report was presented to Major General Samford at the Pentagon. Soon afterward, Ruppelt was given the job of heading up official USAF investigations into the UFO phenomenon. He took over Project Grudge in September 1951 and instituted the first standardized UFO reporting forms. He coined the phrase Unidentified Flying Object ( UFO ) and hired Dr. J. Allen Hynek as Chief Scientific Consultant. During March 1952 more funding was allocated to UFO investigations and Project Blue Book was created. Ruppelt headed Project Blue Book until late in 1953 during which time he and the Blue Book team personally investigated dozens of sightings and reviewed thousands of reports. Ruppelt and his team had Top Secret security clearance and were not required to follow the normal chain of command when investigating sightings. Although Ruppelt's resources were nominal by USAF standards, he still had access to information and resources beyond the dreams of any civilian interest group then or now. Following the Robertson Panel inquiry, Ruppelt was reassaigned, ending his official capacity in Project Blue Book. It is likely that this was a result of his objections to the outcome of the Robertson Panel inquiry, which resulted in orders to hide sightings when possible and debunk the rest by discrediting witnesses, including USAF pilots if necessary. After his USAF years, Ruppelt worked as an aeronautical engineer for the Northrop Aircraft Company. However, he kept in touch with Blue Book staff and In 1956 released a book titled, The Report On Unidentified Flying Objects. The book describes a number of important cases and tells how a Top Secret "Estimate of the Situation" concluded that some UFOs are extraterrestrial spacecraft. In 1959 Ruppelt released an updated version of his book that included three additional and highly conservative chapters downplaying the reality of UFOs. Some ufologists have proposed that Ruppelt's out of character additions were prompted by official pressure. Coincidentally or otherwise, he died less than a year later on September 15, 1960. His death was ruled as heart failure, something relatively unusual for a seemingly healthy 39 year old man with an armed forces background.